Before I have written my review for this film, I have seen the film 3 times, and after watching it the second time, I got a better understanding on the film. Now with that out of the way, I can say, I really loved this film. Lets get into why I did. Story: It involves an island girl named Moana from Motunu who was chosen by the ocean to get the Demigod Maui to return the Heart of Te Fiti that he stole and restore the curse that began infecting islands after being stolen. This is a pretty simple story in its own right when it comes to basically it comes down to the characters traveling along a huge ocean like this is the animated movie version of The Legend of Zelda: The Wind Waker, but what works here is the characters which mostly consist of Moana and Maui interacting with one another and they help carry the movie as they both learn about each other and overcome certain problems to get to the end goal. Characters: Moana (Auli’I Cravalho) is an island girl to become the next chief after her father who strongly wishes for her to remain ashore with her people aftr an incident happened in his childhood and the happenings of the removal of Te Fiti’s Heart. Maui (Dwayne “The Rock” Johnson) is the self-centered demigod who can’t help but brag about himself for how much he helps people and loving every minute of it, he also has a little tattoo persona of himself who has its own personality and is quite the character in his pantomiming and reaction to Maui’s antics who is a delight to watch. Tamatoa (Jemaine Clement, Nigel from Rio, Flight of the Conchords) is the giant treasure collecting crab who has Mauis fish hook that he lost in the battle of Te Kā. This has to be another animated film to list for smallest voice cast in an animated film along with films like Home and Up. But even then, when you have great characters and voice actors like these, you forgive it for that. Plus the movie is basically about Moana and Mauis journey to restore the heart and what great characters they can be when you hear about the backstory of Maui and Moana’s struggle to come to grips with why the ocean chose her and being helped by her grandmother for guidance. Both the performances of Dwayne and Auli’i are very fitting to the characters that they play with Auli’I getting very good praise for this being her first film and really delivering a convincing performance that almost feels like she has been at this for years. The one thing this film could have helped established better was the relationship between Moana and her father. 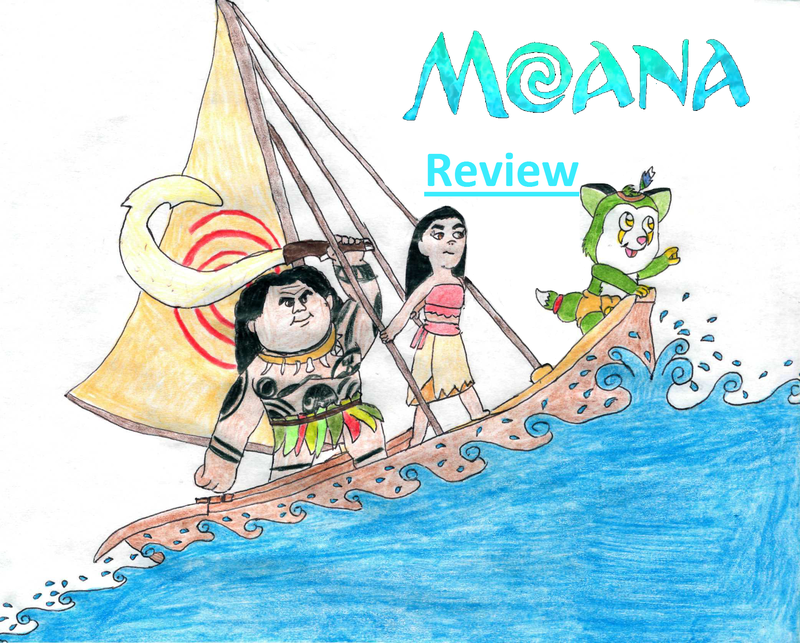 He was very strict in Moana not wanting to take to the ocean, but when she was told she must go and venture past the reef to restore the heart, their wasn’t any scene before it that helped established that he was ok with it. I mean, its not a pothole, but I figured she needed some kind of reassurance from her father as well since only her mother was the one that was helping her out during her leave. You get that at the end, but it is somewhat of a short lived remembering on what her father told her and he was fine in saying that it suits her, but I don’t know, it didn’t seem as satisfying. It’s a small nitpick in a great list of character personalities and interactions. Music: This is quite the soundtrack. Lets start with the score which is done by Mark Mancini (Tarzan, Brother Bear, Planes) who was able to capture the authentic beats and flavors of the Polynesian culture perfectly. This has to be one of the most traditional scores I have heard since Brother Bear (which was done by him too) and the songs, oh my goodness the songs, they are well written and wonderfully sung, thanks to the ever incredible Lin-Manuel Miranda (Hamilton) and Opetaiti Foa’I (Te Vaka) The song “How Far I’ll Go” is this years “Let it Go” and “You’re Welcome” is a strong testament to how you make a song that not only accompanies someone like Dwayne, but helps capture the personality of someone like Maui and my personal favorites are “We Know the Way” which tells about how Moanas people were voyagers before the island curses and has this very traditional Polynesian language making it very reminiscent to songs like “Steady as the Beating Drum” (Pocahontas) and “Transformation” (Brother Bear) and my other favorite is “Shiny” which is sung by Jemaine Clement who gives off this kind of David Bowie like impersonation accompanied by some rather silly lyrics about how he looks on the outside and also shedding some light on his thoughts towards Moana and backstory of Maui which is very clever song writing that you don’t hear very much these days, so props off to Lin-Manuel and Opetaiti. In the longrun, I give this film a 9.5 out of 10. It is high up there with the other greats of this year like Zootopia and Kubo and the Two Strings and is a must see for anyone who loves Disney, musicals, or even fans of Lin-Manuel and the Directors Jon Musker and Ron Clements who have also directed The Great Mouse Detective, Little Mermaid, Aladdin, Hercules, Treasure Planet, and Princess and the Frog, which is something I should bring up in the marketing of this film. They mention that Moana is from the studio that did Frozen and Zootopia, which is fine, but it would have been nice if they added “From the directors of The Little Mermaid and the Princess and the Frog” I mean hey, they did it that way for Princess and Frog, why not this one. I just think it’s important that they bring up it was done by the two directors who basically helped launch Disney into their renaissance back in the late 80s early 90s. But I digress. In a trailer for this film, I think I saw Maui * change shape ! If so, then his being described as a demigod may explain that. * This is a person I would NOT want to jangle with in a dark alley -or on a sunlit street for that matter. Yea, I know he can change shape and that he's a demigod. "Sing" should have been set in Zootopia. This is a review about Moana, whats that gotta do with what you're talking about? Now that you mention it, I realize your point. You DID mention Zootopia, which got me going. Also when I write fan-fiction, I tend to tie everything into one continuity.